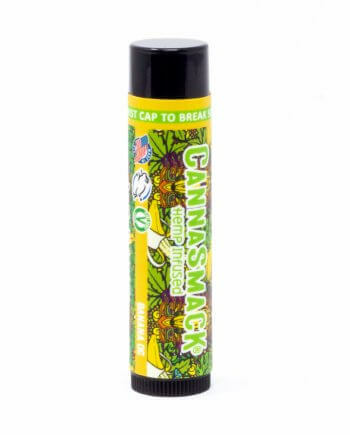 Twist the cap and there’s no going back; anyone within sniffing distance will be drooling over the sweet nostalgic aroma of Cannasmack Bubblegum Kush, a lusciously silky vegan lip balm. Infused with premium hemp seed oil, paired with a formula of all natural ingredients, CannaSmack offers a kiss of reliable hydration with vitamins A, B, D, E and Omega 3&6 fatty acids. 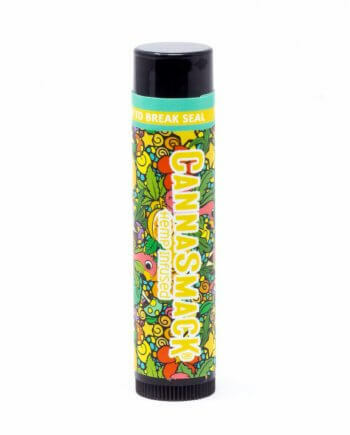 Your new favorite lip balm is decorated with a pattern that pops; featuring imagery of unicorns, rainbows, flowers, mushrooms, balloons, and of course: hemp leaves. Note: This listing is for the Non-Shimmery variation of this flavor. The shimmer Bubblegum Kush has a similar black label. I got this one for my daughter after her constantly stealing my peach one….small secret, Im constantly stealing this one from her when she’s not looking because of how amazing it smells. I got mine at Hot Topic, and I love it! Nice scent, nice flavour, very high quality.